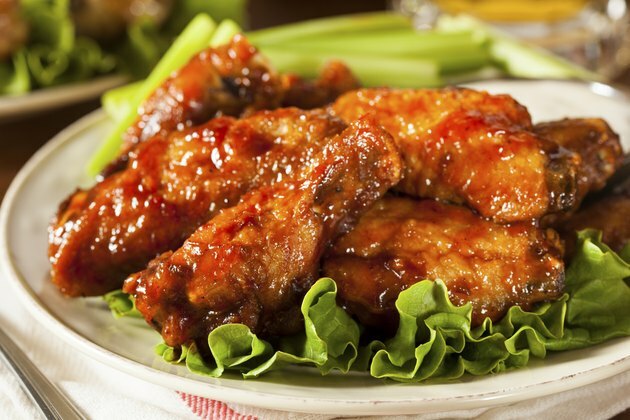 Chicken wings are a popular appetizer and snack food that can be baked or roasted in a thick barbecue sauce or marinade. When they're fried, the wings take on a decidedly different taste and tend to be greasier. While chicken often provides an effective source of protein and typically is lower in fat than other meats, the frying process negates most of the health benefits you get from choosing chicken as your protein source. The number of calories you'll consume when eating fried chicken wings depends on the whether or not you eat the skin and whether or not the wing has been coated with batter. According to Fat Secret, you'll consume about 81 calories from a small chicken wing with the skin that's been fried with no batter. Take the skin off before you fry the wing, and you'll only consume about 34 calories. The U.S. Department of Agriculture reports that one skin-on chicken wing that is coated with batter and fried has close to 159 calories. Chicken wings are relatively high in protein. One chicken wing will have 5 to 9 grams of protein, depending on the size of the wing and if you eat the skin (which does contain some protein). Fried wings are relatively low in cholesterol, with about 23 grams in each wing. Without batter, they are free of carbohydrates. Chicken wings also contain potassium and iron. Frying adds excess fat to your chicken wings. A fried wing with no coating has about 6.3 grams of fat, but if you take off the outer layer of skin, you'll only consume about 1.3 grams of fat. One small battered and fried chicken wing with the skin can have as many as 10 grams of fat. Eating fried foods on a regular basis is directly linked to obesity, according to researchers at the Department of Preventive Medicine and Public Health in Madrid, Spain. In a 2007 study, researchers found that body mass index, waist circumference and overall weight were higher in men and women who derived the majority of their caloric intake from fried foods. According to the Mayo Clinic, labels on chicken wings can be deceiving, especially if you're trying to find healthy and environmentally-friendly wings to fry up. For example, there is no federal category for poultry raised "chemical-free." If you purchase chicken wings with this label, there is no telling what it actually means. "Cage-free" chickens are not necessarily allowed outdoors, and the term "antibiotic-free" is not a recognized federal labeling guideline.